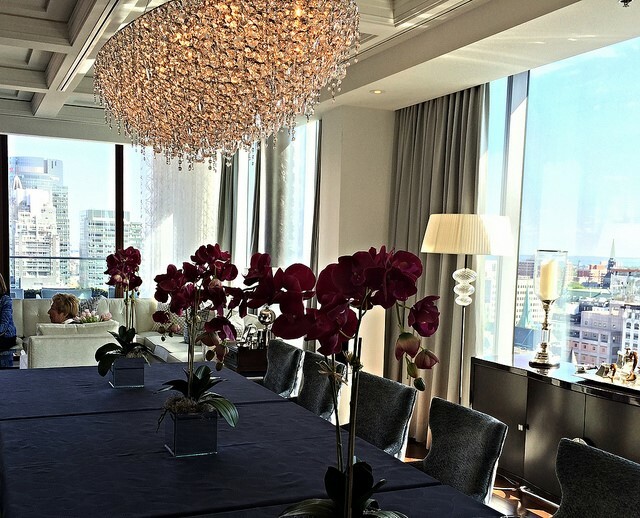 By now we are all aware of the boom occurring in the big cities – especially Sydney. Prices have climbed so much, in fact, that it’s even got some yelling ‘bubble’. While it certainly isn’t yet a bubble, there is no denying the sharp price increase over the last year and, as a result, people searching for homes have generally crossed the blue-chip areas off their list of realistic options. You may be surprised to learn, however, that there is still very affordable property available in these areas, and the latest statistics back me up on that. In fact, some of the major cities may even be the perfect place for your first home. The trick here is simply to look in the right place – apartments. The latest data from CoreLogic’s 2015 Australian property report has revealed that a big gap between the prices of houses and apartments has opened up this year - particularly in the more esteemed areas. In fact, the areas with the largest differential between house and unit prices are predominantly in those ‘booming’ locations. And this trend is similar across all of the major cities. The numbers show that while free-standing houses have ascended well beyond most people’s reach, apartments in esteemed suburbs are still very much an option – even for those buyers on a budget. And there’s more good news: first home buyers in many states are being incentivized through government grants and stamp duty concessions to buy new apartments in a bid to support our construction industry. This gives new buyers an even greater financial advantage when shopping for their first home and gives them even greater scope when looking for an apartment. Are apartments really a solid investment? The short answer is yes. Having an apartment in a good area is always a profitable asset – and is going to become even more so over the next few years. The old logic was that houses have more land value than apartments so were therefore considered “superior” assets. However, the key is proximity, location and amenity. These are the key factors that drive the real value of property. 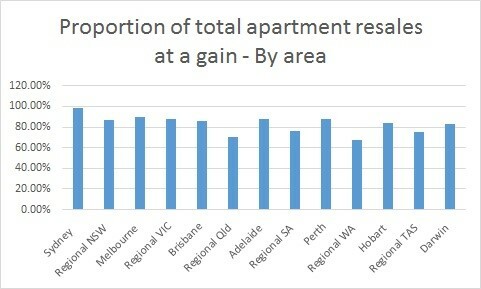 Apartments in high demand suburbs such as Potts Point, Kirribilli, Surrey Hills or Bondi still have good land value, but without the burden of as much maintenance. The old adage of location, location, location will always hold true! The apartment resale prices bear testament to that – particularly this year. 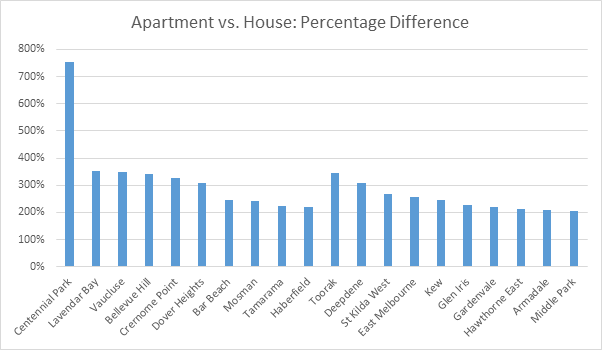 In fact, if we look at CoreLogic’s 2015 review of Sydney we see that apartments actually outperformed houses in the first quarter. 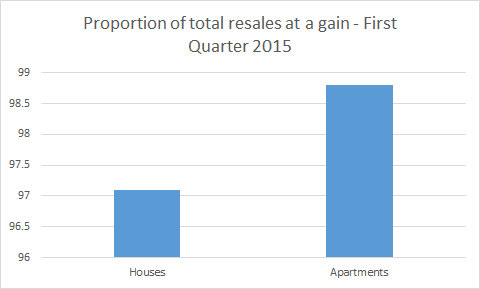 And the proportion of apartment resales at a gain are healthy across the board. What’s more, the demand for apartments is growing, not just because of their proximity to CBDs, but also because the number of small households is higher than it’s ever been and is still on the rise. The Australian Bureau of Statistics (ABS) projects that the number of lone-person households will swell significantly in the next decade or two, and will be between 2.8m and 3.7m by 2026. This means that demand for apartments, both for renting and for sale, is only set to increase in the years to come. What are the advantages of apartment living? 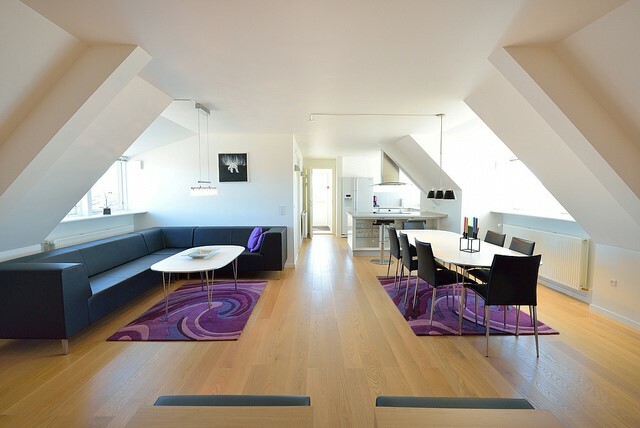 Living in an apartment provides a lot of benefits and conveniences which one does not get with a free-standing home. Below are the few advantages from an investor’s perspective, as well as a few that I’ve heard from my clients over the years. Aside from their affordability, another major financial benefit is the prospect of renting. 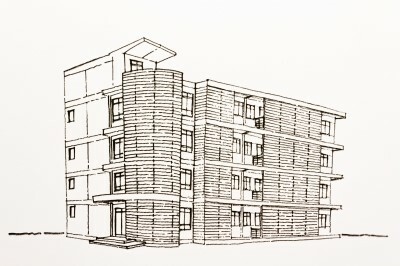 Apartments will always be popular with renters, meaning that you always have the option of passive income without the hassle and difficulty of maintaining a house. As discussed above, maintenance is easier as repairs and upkeep are overseen by the body corporate. The ‘lock up and go’ aspect is always appealing as it gives owners and renters a lot of freedom. Apartment proportions are convenient and services such as cleaning, renovations or interior decorating are charged at a better rate. 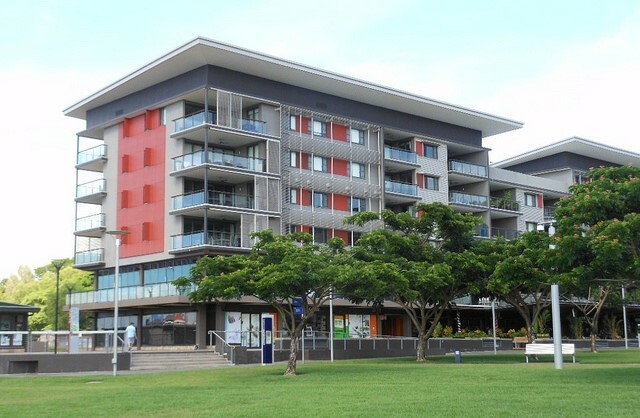 Apartments are typically in close proximity to CBDs, shopping centres and various other useful amenities. The way we’re living in Australia is changing and, for many people, a cosmopolitan lifestyle is becoming more important than the old Australian dream. Work, restaurants, cafes and beaches are creeping higher up the list of priorities and apartments are perfect for those who want this lifestyle with a side of affordability, convenience and freedom. Typically apartments with good views can charge higher rent, however, if you’re buying in a quiet/family suburb you may want to consider the ground-floor as potential buyers are more likely to be elderly or have children and want an easily accessible apartment. Or perhaps a small courtyard for a cat or small dog in a pet-friendly complex. Apartments facing north and away from roads are usually more desirable. Also look for one with plenty of natural light as this gives less of that ‘high-rise’ feel. The more bedrooms and the larger the floor space the better. Having more bedrooms means that you can charge more rent, and your tenants have the option of splitting the rent to reduce costs – which increases your market of possible renters. Look for apartment blocks which are appealing from the outside as well as inside. Structures which are well-designed, solid, have high ceilings, balconies and big windows are a major plus. Parking is usually at a premium in areas where apartments abound so be sure you get at least one secure car space. Undercover security parking with internal access is the ultimate, but don’t be too picky if it’s simply an outdoor car space - but make sure this is allocated to the apartment and on title. Be sure to carefully look over the contract of sale and make sure the building is properly insured. Also have a good look at the Strata report and have your solicitor explain what it’s all about in plain English. Make sure the sinking fund and admin fund are up to date.